Hey, muffins! I know it’s been a minute since I wrote you last – lots of new stuff brewing up here in my magical slum! I will fill you in on recent developments in a forthcoming post (does anybody still read these? ), including an update on brand new baby Horizon – but here’s a quick heads-up on something I’m doing next week. The show is called “Patti Murin: Literally.” Or maybe it’s “Literally Patti Murin.” I can’t remember, because it does not appear on this poster. Which, ya gotta admit, is kinda deep. On Monday, August 11, I will be musical director for the hot mess you see on the left of this page. 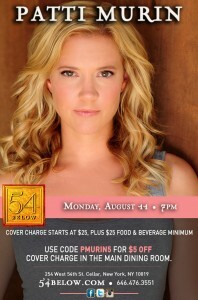 Her name is Patti Murin, and she is a Broadway star who is hilarious and sings like a maniac. In fact, she pretty much does everything like a maniac. Because she is a maniac. She’s really terrific, so you should come. Also, she’s an actress, so if the entire Eastern seaboard doesn’t show up, it’s gonna be my fault somehow. So help a sister out. And Patti! This entry was posted in Appearances, Blog, Music, News. Bookmark the permalink.